Let me start by saying if you are worried about choosing your wedding dress, don't be. I want you to take your mind back to when you said yes and think about how you felt at that moment .... happy, excited and ready to explode? That is how you are going to feel when you find your wedding dress. 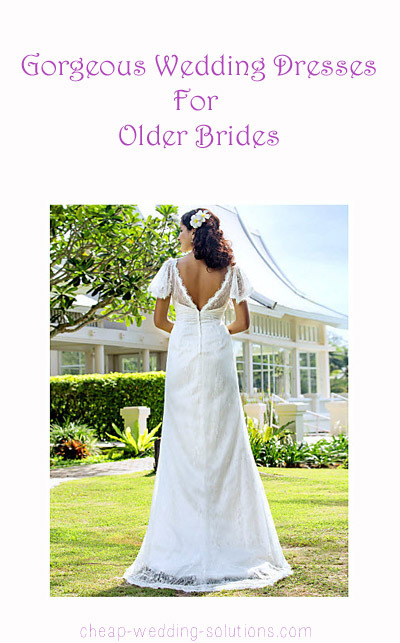 There are no rules for wedding dresses for older women and we are not going to tell you what you should and should not be wearing. You need to feel happy and confident in the dress that you choose. To feel happy and confident in your choice of dress you need to start by thinking about the style of wedding gown that will suit you. or a Suit, you can even have trousers if you want! Then think about the color, of course you can wear white but there may be a color that suits you better. Plus wedding dresses in colors such as pink, gold, red, teal, blue and even black are very fashionable. Would you be happier wearing a jacket or shawl? Again, this is all about you finding the dress that will make you feel a million dollars. Lace is a good way to cover up a bit but without looking like you are over dressed! Lace sleeves or a lace bolero jacket would look very glamorous. I wore a lace floaty top over my lace wedding dress and it felt fab. There are a number of online options when it comes to buying your wedding dress and they will normally cost you a lot less. They all have quite a bit of choice, here are some we have selected so you can see the variety of choice you have from these suppliers. Click on the image to see more about each dress.